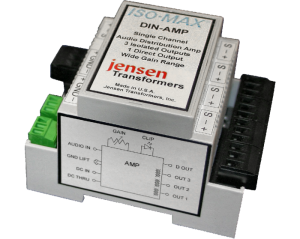 The Jensen Iso-Max DIN-AMP is a high performance distribution amplifier ideally suited for the AV systems contractor to easily integrate into a 19” rack or Nema enclosure by mounting it onto a standard DIN rail. Connections to and from the DIN-AMP is done via screw-down plug-in terminal eliminating the need for costly connectors. 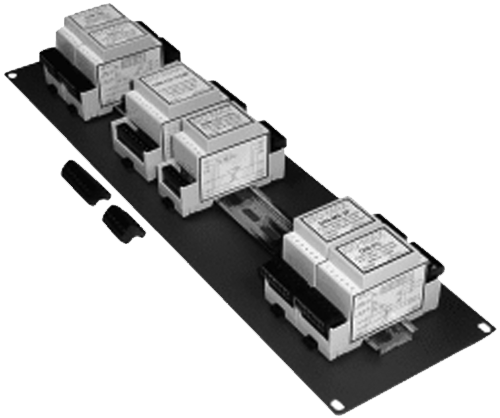 3 Transformer isolated outputs eliminate ground loops on all 4 outputs. The unique design features the patented InGenius® input stage – an active drive circuit that replicates the noise rejection of a transformer, while providing upwards to 250mA of peak drive current. This enables the Iso-Max DIN-AMP to drive balanced cables upwards to 2500 feet without degradation. Sonically, there is no rival; the DIN-AMP’s no-coupling capacitor topology delivers an exceptionally linear response from 10Hz to 100kHz while exhibiting less than 0.03% distortion at +24dB. This is augmented with a Jensen transformer on three of the four outputs to isolate the source and destination preventing ground loops that often plague large scale system designs. Each output features an individually adjustable level control with up to +13dB of gain plus an input level sensing circuit with LED overload indicator.